Turbo Tech Racing's Ecotec Upper Engine Mount for the 2005-10 Chevy Cobalt 2.2/2.4L HHR 2.0/2.2/2.4L (Including SS) Automatic Transmission Models. The Upper Engine Mount eliminates movement that your factory mounts have, maximizing torque and the transfer of energy to the driveline. Unique bushing design, only one in its class to help prevent movement; unlike other brands which use a round bushing deisgn. Features high quality powder paint. For maximum performance we recommend the Turbo Tech Racing Bushing Kit. 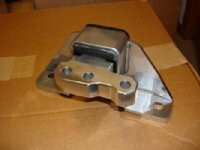 Review of product: This will make your car more responsive! Won’t Increase HP but the power transmission to wheels is almost instant. You traction control rarely if ever goes off! There is more vibration but well worth it! I have a 2.4L HHR LT2 totally worth the cost!